Claudia: Who is reading “Maybe Someday” by Colleen Hoover? I am!!!! Freaking awesome!! Sarah: It’s AMAZING! Loved!!! 5 huge stars! Kathy: I loved it so much! Be sure to go in blind! Don’t read reviews! It’s all the little surprises in this book that make it special! Yep! I just read my heart out. And now I’m grinning, feeling a little melancholy ’cause I miss the crew (and I miss “being” Sydney”), and now I wanna snuggle real bad. Who wants to snuggle? Beware of this book… ’cause it gives you the need to *snuggle*. I’m not kidding! Sweeeeeeeeet!!!! But… daring. Not CRAZY daring… but she definitely took ’em somewhere that surprised the heck out of me. There was healing, and self-growth in this book (as in all of Colleen’s books), but OMG… she sure as heck let ’em make some mistakes and hurt people in the process. Yep. Risky business, my friends. Especially when it comes to a slew of innately good people (and not a one of ’em can you hate). Well.. maybe one REALLY ticked me off. Actually, two, but I’ll ignore that “other” one, and focus on the one I was REALLY liking… until I totally wanted to punch him/her? (<—I won’t even reveal that much) in the nose! And I totally don’t punch in the nose. Actually… I don’t even punch. I mean… it’s pure Colleen Hoover, ya know? The characters are just so likable. Awesome but real. They have pasts, and concerns, and worries, and flaws, and *issues*. Their stories (especially Ridge’s) are Whoa! But solid. Yet deep down, they feel like us. Lovable. I mean, come on! We so ARE lovable and that’s why we connect to her characters so hard. So what’s it about? I’m keeping this part short and sweet, ’cause the “KA-POWS!! !” happen pretty much right from the start! She (Sydney) lives across the *waggles hands in the air* way/area thingie/street from him (Ridge). He plays guitar on his balcony. She, sings (and writes lyrics) to his songs on her balcony (not knowing that he notices she’s singing to his songs…). They don’t know each other, or ever talk to each other…. but sorta have this private *thing* going on. But then they do connect. And he tells her a.. er… life-altering detail. And she and he wind up being very good friends. The very last thing I want – or even need – is to develop a crush on this guy. However, I’m thinking that may have happened before this week. So good. In fact, I awwwwwww’d like crazy… especially at one part towards the ***** that just melted me into a puddle of love-mush. I couldn’t believe my eyes at the… waaiiiiit wait. I gotta stop here. Too much too soon. You guys’ll know when you get to it. There are plenty of “it’s” (oh this is SO good) but this one part… awwwwwwwwwwwwwwwwwwwwww!!! <—- my actual note. Maryse: OH YESSSSSS!!! OMG the ink pen… never have I wanted to be drawn on so badly!!!!!!!! ‘Cause… despite their innate goodness, they still react humanly. Ridge: Really, Sydney. I haven’t been looking at it like that at all. The last thing I want is for things to be weird between us. I like you. I have fun with you. But if for one second I led you to believe that something was going to happen between us, I am so, so sorry. Maybe even what some would consider selfishly at times ’cause they’re caught up in the now, in the *spoiler* (okay I totally spelled that one out at first, but you know what? I’m gonna blank it out). Maybe you don’t know ANYTHING about this book yet, and I’ll let you discover it for yourself. But just know that THAT part (that I blanked out)? Therein lies a HUGE part of the drama. A BIG part (and the part that had me salivating for relief). Once it “got me” I didn’t put it down until I got what I needed. *whooooo* what a ride. But don’t go in already thinking you know what you’re in for. There are oh… two… maybe even three twists? Well, I almost gave away a twist… it’s the *spoiler*, but for most of us, that’s a PLUS so I had to let you know you were in for some “feels”. *sigh* I wish I could tell you, and maybe from other reviews, you already know… but I know plenty will read this review with NO clue to the “surprises” and THAT (to me) is how you should go into a book. Yep. Typical Colleen Hoover “gotchas” (which, may I remind you are so fun, as long as you don’t already “know” going into it). She’s all…. SURPRISE!!!!! and you’re all… Whoa! I didn’t see that coming (but YAY!!!!). Or maybe you’re all ROAAAAAR!!! But that’s the best part, am I right? Nothing better than having an idea of where it’s going, and still being caught off guard, not once, but maybe even TWICE. And if you didn’t read ANY reviews, maybe even THREE times. So… let’s add it all up, shall we? All of that deliciously *spoiler* heartache-y tension + those twists + the incredible depth of emotion and angst that loads us in “feels” right to the very end + that signature Colleen Hoover “funny” (don’t even get me started on the “Warren pine-sol” reveal LOL!!!!!!!!) = You’ve got yourself an awesome read!!! 4.5 stars!!! Oh… that one part? In fact… so MANY parts? 5-stars… *sigh* lemme think on it a bit. But, either way —> no doubt, I HIGHLY recommend and LOVED it! Maryse: Just finished “Maybe Someday”. So good and sweeeeeet and heartache-y, but nothing tooooo crazy. Just the way I love ’em. Well… I do love the crazy ones, too (hehe), but this one was pure Colleen Hoover, and now I just wanna snuggle. Chrissy: Just finished it too!!! Major book hangover after reading Tristan and Danika’s books and now this one. Not even sure what to read next. Trina: So I just got done marathon reading Maybe Someday by Colleen Hoover and I’m completely floored. Book hang over can’t even describe where my head is at. I am speechless and if you knew me, that in and of itself is a miracle….. Just…. Wow. Maryse’s Book Blog: 4.5 easy!! Once it “got me” I read it straight through… enthusiastically. And that didn’t take long, ’cause the intro is quite exciting in a UGH!!! way. Love that. Chrissy: I was going to read it in one seating but having had 3 nights of 3am readings I needed to get some sleep. Maryse’: Yep… I started it and passed out early-ish into the book (but I was exhausted). This morning picked it back up and never let go. Maryse’s Book Blog: Okay so who wants to snuggle?? Bobbi: So so so so good!! Broke my heart and then put it back together again. I HATE HATE HATE *spoiler*, but that was not the case with this one. Maryse: And I LOVE *spoiler*, and this one was exciting (I feel bad for saying that)! Donna: I want to read this one. I haven’t read her books yet but have one or two on the nook. Maryse’s Book Blog (Paranormal & Urban Fantasy) Donna!!!!!!!!!!!!!!!!!!!!!!!!!!!! OMG PLEASE. Pleeeeeeeeeeeeeeeeease read any of her books!!!! PLEASE. You will love us forever, I promise. I recommend Slammed ’cause it was my first and I had EVERY emotion I could have. DO NOT READ ANY reviews of it, go into it blind so you can experience the fun reveal and all of the reactions that will go with it. OMG PLEASE! Tammy: Great book but my favorite is Hopeless. Shannon: Slammed is still my all time fave! Maryse: Slammed is my fav of all time too. But I know many consider Hopeless the BEST (and it’s FREAKIN’ fantastic) but me ‘n Slammed? We’re tight. So there you go, Donna. Can’t go wrong with either one of ’em. Shannon: I finished it yesterday! Loved it so much. I love Ridge almost as much as I love Will Cooper. I also quite enjoyed the soundtrack! Darla: And the change up in the *spoiler*? FINALLY! Loved every agonizing minute of it. Clare: Loved it too, didn’t want it to end! Rebecca: I literally just finished Maybe Someday. Oh my heart!!! There was no ugly cry for a change, but my poor heart hurt for them!! It ached!! Absolutely beautiful, heartfelt!! This one is actually my favourite. I cant wait to read this!!! Awesome review! ! OMG!!!!! Love this <3333 So excited! I love all your books, and I am just hoping that you never stop writing! Great review. ….would love to win this book! Great review. I’ve been so excited about this book, and now I’m that much more excited. Awesome! I love this review, such a good book! Love this review..Loved this book! I read it way to fast and was very sad when I reached the end! Colleen is my favorite author of all time and this is probably my new favorite book by her. Everything that she writes is pure genius! I love, love, love the creativity put forth by her and Griffin. It was a magical reading experience I will never forget! Fantastic review!! Love this one!! So excited to read this! Can’t wait! Wow. What an amazing review!!! I can’t wait to start this book!!! Love, love, love this book along with the music. Wasn’t ready for it to be done. Best book I’ve EVER read!! I absolutely loved this book!! I would be so happy to have it on my shelf:) I am starting my reread of it tonight! Hands down one of the best books I have ever, ever read! Great review. I’m reading Maybe Someday now and I’m in love with this story!!!! In love I tell ya!!! What a wonderfully fun review. Thanks for sharing. Get review. Have to wait until the weekend to read but am so excited for it! Love the music also!! Most definitely looking forward to this book. I have yet to be disappointed by one of her books. I’ve already read it, too. So awesome! Having also read the Hopeless series, I can say that Colleen writes very tasteful yet realistic stories that draw you in. In a short period of time, she has become one of my favorite authors. Love Colleen and Love you Maryse! Thanks for sharing with us! Great review! Can’t wait to read! I’m listening to the audible version! “Sounds” great! Have not had a chance to read this, but am excited too. Have read all other books by Colleen so I am sure this one will be just as good!! I am looking forward to this one so much! More ammunition for the fire. I keep hearing nothing but good hinges about this book. Love everything Colleen writes. Can’t wait to devour this one! I loved this book and music!! Can’t stop listening to the music!! What I love the most is that it delt with realistic feelings. Life isn’t always easy. You have to make difficult choices sometimes. I so hope we will get a Warren story!! I will definitely reread this one!! I read this book in one day…could not put it down! Just like all of Colleen Hoover’s books. I’m so glad I went into reading this book blind. It had a few surprises in there that made it more special. This book had me crying at times..but in the end I was all smiles! Loved the characters and their struggles and the emotional rollercoaster Colleen Hoover always takes you on! Loved it so much! Love, LoVE, LOVE Colleen Hoover! #MaybeSomeday #CoHorts! Love Colleen Hoover and was glad to have met her this fall. She is amazing author that’s brings you into the characters in her books. Maybe Someday blew we away what a book, read it in one day couldn’t put it down. I’m not too far into the book yet, but am so excited! Thank you for the awesome no-spoiler review! Colleen has such a gift with words! She puts you right into the character’s world! Amazing!!! Now to reread along with Griffin in my ear! Sweet! Un-FREAKING-believable! It’s been 24 hours since I finished and I STILL can’t believe how wrapped up I am in this! Diabolical! I’m trying to read something else and I just can’t do it! I’m ruined! RUINED! Love this!!! No spoilers!! Great review! Ruined…. In such a good way. Loved it! Think I might read it again this week. I’m ready to read it! I love reading a great review with no spoilers!! Love Colleen and this incredible book! I loved this book so much I don’t even have words. I didn’t think I would love it as much as I did.. but wow! so good I think I I have a book hangover ! :p and I would love to see this book, or really any of Colleen hoover’s books as a movie.. that would be amazing! Loved this book! Can’t start another one because I’m still in the world of this book!!!! Loved it! Such a great reading experience! I devoured this book. I’ve been walking around singing either I’m in Trouble or Maybe Someday for weeks! Haha. I love Griffin’s voice. I love Colleens writing. I LOVE a Maybe Someday. Haha. I can’t stop gushing about this book. I want to read it again! I’ve listen to the soundtrack almost non stop since finishing the ebook two days ago. Colleen Hoover is awesome! I can’t wait to read this!! It sounds so exciting!! I loved this book. I love CoHo. This book was awesome and had so much heart. Loved the characters!! I would highly recommend! Loved this book it’s a must read. Haven’t read any spoiler reviews yet, have it, but haven’t started it yet. Cannot wait to get into it though!!! Love all of the other Colleen books; Slammed by far my favorite!!! Antiher piece if heaven from Colleen Hoover! Loved this book! I get most of my book recommendations from your blog. Thank you, Maryse. I can NOT wait to sink my teeth into this bad boy! I loved all her books but Hopeless is and will ALWAYS be one of my all time favorites! I loved this book! Such a great review! I just finished reading it and you’re making me want to already re-read it! Colleen’s best book yet!!! Loved it sooooo much!!!! Awesome as always! Can’t wait to read this book! You most definitely have me intrigued to stop what I’m currently reading and move on to read it NOW!! I’m so excited to read this. Heard only good things about it!! AHHHH! I can’t wait to read Maybe Someday!!!!! Colleen Hoover rocked this book like only she can!! Another favourite for me! The twists, the tears, the laughs, the MUSIC and lyrics. Beautiful!! Reading just doesn’t get any better than this! I love the story! Tears me up and fell in love. I loooove Collen Hoover! Brilliance, No doubt! Eagerly awaiting. Cannot wait to read this! Her books are so wonderful! My addiction! Love anything By Colleen, and I love all your reviews!!! Can’t wait to read this one…will start it tonight! I love her books… can’t wait to read this one! Thanks to The author’s tip!! The pen…. Oh that pen!! Great review!! I can’t wait to read this book!! Sounds like an AMAZING book just like all of Colleen Hoover books! Cant wait to get to this book on my TBR list! Great review, Maryse! I loved Maybe Someday. I am dying to read this! Colleen can not disappoint! Loved your review!!! I want to read it like now!!! Eek! Too much spoiler! So excited!! I can’t wait to read this! Great review. 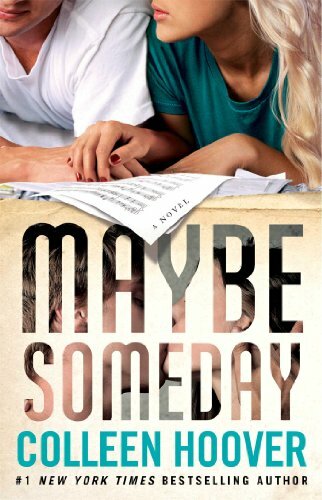 So stoked to read Maybe Someday… and a signed copy by Ms. Hoover would be awesome too!! Cant wait to read it! Awesome review! Getting ready to start reading and I can’t wait!! Just finished this today and absolutely loved it (as I do all things Colleen Hoover). The writing is real and natural and I just loved the journey…the friendships, the heartaches, the humor (Pine Sol!). I felt like it could’ve gone anyway between the three and so badly wanted to peek at the last chapter bc it was killing me! But NO – I did not and am so, so glad. I went into this blind and definitely glad I did. You should too!!! Like right now!! Go!!!!!!! WOW! This book seems really amazing! Love your review, by the way! I AM SO EXCITED TO READ THIS BOOK!!!! I am so happy I was able to read an early version of this because yes, I had absolutely no spoilers. Colleen Hoover does it AGAIN!!!!! This book was beyond amazing. I was so torn the entire time and was just wondering what she could possibly to bring them together.. I read this book in 24 hours while juggling work and school and it was so worth it! Loved loved loved it. Might be my favorite one yet but I am not forced to patiently wait while she writes and releases her next one. 5 STARS!!! I love all of her books and I cant wait to read this one! I have just started reading this and I’m getting annoyed with the constant interruptions I’m getting. Can’t the world just go away and let me read? I’m sure the kids can survive without a meal or two lol. I would absolutely love all of her writing! I have all of her books except this one! i seriouslly can’t wait to read it!! i just need it !!! Hands down one of the best reviews I’ve ever read for any book. Love, love, loved the book. Can’t wait to read it again. Can’t wait to read it! My friend loved. All of Colleens books are fabulous! Great review – I loved the book too! Loved this book! Your review was right on! Wow! I love all of Colleen’s books, she has outdone herself on this one! I cried and laughed. What I loved was the soundtrack that goes along with the book, was just wow! If you haven’t read Sydney and Ridge’s what are you waiting for. 5+ stars! I can’t wait to read Maybe Someday!! I’ve been hearing only great things about this book! I’ve heard great things about this book. Can’t wait to read this. Oh gosh, I’m dying to read this book!!! Absolutely loved it! Colleen does it again. Such a wonderful story and fantastic characters. Just finished and LOVED this one!!! Thanks for the review. This book is on my TBR list. Absolutely LOVED Maybe Someday!! I almost wanna start it again right now!! Ok just finished….I have read all her books and waited patiently for it…I loved the whole story..the writing far exceeded expectation.. who he came up with the band me..wow…like I said loved the story. But I have t say I needed more closure at the end. Besides the fact I always want an epilogue and it didn’t have one, I felt like I needed to see more into their future. Still loved it though. Great review! Starting this one tomorrow night!! Ok just finished….I have read all her books and waited patiently for it…I loved the whole story..the writing far exceeded expectation.. how he came up with the band me..wow…like I said loved the story. But I have t say I needed more closure at the end. Besides the fact I always want an epilogue and it didn’t have one, I felt like I needed to see more into their future. Still loved it though. I keep reading all these awesome reviews and makes me wanna cry. Reading reviews like this one are getting me so excited to read the book. Come faster weekend! I love ALL of Colleen’s books. Maybe Someday is my favorite. The music along with the book made it extra special. She is a genius! Ahhhh!!!! This book was amazing! I love Colleen’s stories and can’t wait to read this story!! It is loaded on my Kindle, but I’m saving it. It sounds so good. Ahhhhhh! I can’t wait to read this! I need more hours in the day! I need Friday to come sooner so that I can start Maybe Someday. This review makes me want to start it early so bad! I can’t wait to read & listen to the music that was specially made for the story line. I’m so excited! Awesome review I can’t wait to read this. Can’t wait to read this one. Thanks! This book is awsome! The best read ever! Great review . All of Collen’s books are AMAZING. The characters are so well done that they will soon fill your mind and heart. Lol. Awesome review, I love it! It is so hard to write a review without giving away anything. I love this book so much! Love the songs! Phenomenal! Great review Maryse! I read Maybe Someday and I LOVED it! I fell in love with All the characters. The story was beautiful, emotional, perfect! this has easily become my absolute favorite book!!! and this review was fantastic!! I miss this book already and want to read it all over again!! Can’t wait to read this one! Love all of her books! <3 Colleen….this book was amazing!!! Great review!! OMG!!!! The love and feels in this book is worth everything!!! Colleen never disappoints!! Loved Maybe Someday! There was nothing I didn’t love about Maybe Someday. Even the heartache and pain because in the end seeing the love between Sydney and Ridge was totally worth it. Maybe Someday is such a fantastic book for so many reasons. It’s so thoughtful and unique and different, yet is so relatable. I’m looking forward to rereading it. Great review avoiding spoilers, lol. Thanks, Colleen! Maryse, I love the fact that you never spoil books with your reviews. I am so excited to read this one. Colleen is batting 1000 with me (four out of four so far). I absolutely love her writing. Great review,I really want to read this book! I am so looking forward to reading this – busy few days then hopefully I can start next week. Colleen Hoover is such a talented author. I’m reading the Kindle version right now and it’s AWESOME. Colleen ROCKS! Great review, as always 😉 I can’t wait to read this book ! Every time Colleen releases a new book, it becomes my new favourite. Maybe Someday is certainly no exception! I loved it. Maybe Someday -“I want you to move out” what the hell, that made me cry. I loved this book!!! It’s my favorite Colleen Hoover book at the moment. This made me feel all kinds of emotions from happy to sad to frustrated to heartbroken to excited… I’m sure you get what I mean! I love love her books!! Can’t wait to read this!!!!! I’m sooo in LOVE with this book! the emotions of Ridge and Sydney! I can’t help but to get mixed emotions about it! they love each other but at the same time other people will be hurt, but With Maybe Someday, I just love it! I finished the book last night. it was AMAZING!! i never expected the twist. Thanks for the review. Can’t wait to read it. Spring Break next week……major book time!!!!! great review!I loved this book! Amazing read! Possibly my favorite Colleen Hoover book but to close to call. I am reading Maybe Someday right now. Absolutely loving it! I’m currently at work, but my hands are itching to continue reading Ridge and Sydneys story. Colleen Hoover is an amazing writer: each book is a masterpiece! Great review Maryse. As if I didn’t already loved the books Colleen has written, this was SO worth waiting for. I never imagined the characters to be what they were. AMAZING !! I guess I need to read the book in order for that “review” to make any sense…at all! That’s okay. Was gonna dive in anyhow. I really liked this review ! WOW!!! Honestly, I can’t even use words to describe how I feel. This book was beyond Awesome. I love Colleen! This is on my Kindle and I will be reading it this week. I have been listening to the soundtrack over and over again. I would love to have the book to put on my book shelf and show off. Thank you for the opportunity. Wah. I really like this! Hope to get a copy. This book blew my mind. It’s literally become my favorite story EVER. Thank you so much Colleen, for writing this amazing story! Great review as always! And I’m glad you didn’t spoil it, because I think the surprises helped make the story, helped you connected with Syd. I planned on only reading a bit because I’ve been having all night reading sessions too many nights in a row, however, once I was 50% thru I HAD to finish it. Loved it. Funny, serious and seriously perfect. Wow, I have never seen so many comments to one of your reviews! I didn’t read your review, but definitely moved this one up on my list! Thank you for such a wonderful spoiler free review. I cannot wait to read this book. I gobbled this book up in a day it was so so good!! Loved it! I hope I could get to reading it this weekend. About to start this can’t wait! I can’t wait to have this book in my hands!!! Thank you for the spoiler free review! I cannot wait to read this book! Absolutely amazing! Colleen is by far in my top 3 fav authors. I always feel like I am in the book while reading her books and I feel every emotion the mc’s feel. Read it and cry like a baby otter ! Will will forever be my first Colleen Hoover’s sweet hero, but now I want to go on a island with him, Holder and Ridge and live happily ever after. LOVED this book!!!! I love all of Colleen Hoover’s books! I just finished it last night. I could not put it down. I was so wrapped up in the book that I forgot (or was too lazy) to listen to the songs as the appeared in the book. I listened to them after I finished and I realized that hearing them when I was supposed to would have made this book even better. I might have to re read it and listen when I’m supposed to. In the midst of reaing it now. Simply beautiful! Awesome book… I didn’t sleep at all last night, because I couldn’t put it down… sleep deprived after reading for seven hours straight, is totally worth it… now I’m listening to Griffin Peterson and his superb songs for this book… Colleen never makes me regret when I chose one of her works. OMG..I read this straight through. This is the best story, I have to say, I have ever read. A visit to the website for the music and epilogue is a must! I know this will be a book I will read over & over. I wanted to get mad at times but I just couldn’t do it. I fell in love with the characters (Ridge & Sydney) and it would be great to read more about Warren (his story) & Maggie (her story). I need to read this book right now. Oh boy, looks like an amazing story, I’ll read it as soon as possible. I just finished it and I loved it!! CoHo has penned another great one! The music was such an added bonus. Just loved it! And great review Maryse! I can’t wait to read this book!! She is an awesome writer! I’m looking forward to reading this. Everything Colleen writes is Amazing!!! Thank for such an awesome review.